From US-50/301 exit 27 to MD-450 South to the traffic light. Turn left on MD-648 to traffic light entrance to Naval Station. Continue on Kinkaid Rd. for about .6 miles. Turn right through the gate of two large anchors onto Beach Rd. This is the campground entrance. The office is on past the campground entrance about .5 miles on the right. Go past the unmanned guard shack that is past the CG entrance. Go to the LEFT of the guard shack and on down the hill. The first big brick building on the right is the rec center where you check in and pay. Call in advance and they will assign you a site and let you get set up before you have to check in. Parking at the rec center is not RV friendly so take something other than the RV. Accepted. Highly recommended. Max 90 days in advance. Pet allowed, must be leashed and cleaned up after. Excellent access to all of Annapolis. Older CG without sewer and only 30 amp power. Only two or three spots for over 40' rigs. Great location though. Made reservations by phone through Navy Bed = they won't give you one if you say you're over 30' long, but over half the spots will take up to 35' or longer. I was told by another camper to make them online to reserve a longer spot as you can't make one with the MWR people directly. There was one 40' 5th wheel, an at least 40' class A and a couple other long trailers besides us (38') here over the time we spent. The bath house was STILL being worked on and closed. The dump station at the CG is VERY hard to use, but there's another less than a mile away behind the gas station and car wash that's a lot more accessible. This was our fifth visit (4th review). The bathhouse is finally getting a complete makeover - should be completed in October 2018. We arrived on a Thursday, there was no work on Friday and only 6 hours on Monday. With the bathhouse unavailable, the daily rate is $16 vice the normal $22. Alternate shower facilities are available with a map to them and door code provided at check in. 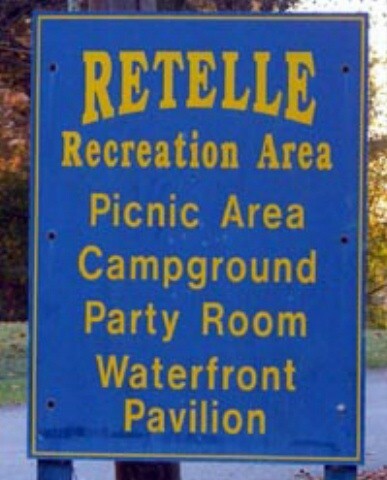 Porta potties are located in the campground. MWR Staff was most accommodating. They allowed us early arrival by a day, then allowed us to relocate to our favorite site. Well stocked Commissary and Exchange are nearby (walking distance). Also nearby is the Gas station (gas only) with car wash and two lane dump station (stop on your way in or out or both). It is still the best value in proximity to both Washington and Baltimore. WOW, as a Army guy I figured that the USNA FamCamp would be terrific. Really any Walmart would be better. Worst campground we have visited. We arrived thinking we could bike the three miles to downtown Annapolis, not so-very little bike friendly roads. Too far to walk. Good news easy walk to commissary and NEX. It is truly a nasty campground. Stay 30 miles away and rent a car. For six years we cruised on our boat and stopped in Annapolis at least twice a year. Visited the Academy, talked to Blue Angels, saw lots of history. Kinda a bummer this time. We did catch a cab twice a day but that adds $30 or so to the daily bill. At least at Sigsbee you can hop on the bike and ride to breakfast or downtown. This place should rate 5 stars for location but the campground and expense of getting anywhere make it a 3 for me. First and last visit. WARNING?? I called first thing June 14, 2018 (9am) Karen answered the phone. I told her I needed reservations to stay at this facility. Before I could get much more out of my mouth she transferred me to Navy Bed reservation. I stayed on the line and finally an operator came on. I explained I needed reservations for June 14, 2018 which were same day as we would be arriving around 3 pm. The operator at Navy Bed told me I needed to call Annapolis direct as Navy Bed does not do same day reservations the facility itself does. So I thank the operator and retailed Annapolis/ Karen. Got answering machine. I explained on the machine I had called before she transferred and Navy Bed told me to call her back for same day reservations. It is now about 9:10 am. Just before 5 pm I get a phone call from Karen asking me if I wanted to come in that day. Almost 8 hours later we had given up and went to stay at a expensive KOA. Karen stated well you didn’t tell me it was for same day. Well Karen you never gave me a chance putting me right through to Navy Bed reservations. I didn’t get a very sincere apology. Got the attitude of really don’t care and don’t want to be customer service oriented. SO BEWARE WHEN MAKING RESERVATIONS HERE. Although a great location, this place leaves a lot to be desired! I rated the value based on location alone. Most sites are short and maneuvering is tight, so it's not big rig friendly at all. The lighting of the area was non-existent at night. It's located on a slope that has little to no grass, and when it rains, there is a lot of mud run going on all over the camp sites. Facility for showers/toilets were bare bones and out dated. Come on Navy, get with the program on this one, I would have expected a lot better considering it's right across the river from the Academy!! There is plenty of land at this Support Facility that a proper FamCamp could be developed on. The one nice thing about the MWR here is that they rent motorboats; however, they too were in poor shape and old - we had to keep the dewatering pump running the entire time, as there was a small leak somewhere in the hull. You must make reservations via navybeds telephone reservations, they frown and act like they're doing you special favors if you just show up trying to check in. I stayed here in tent camping a few nights passing thru in 2017 tent camping as it is too cheap $3.50 a nite, place is no better than when I stayed long term (6 weeks) earlier in fall 2016. Management really is dysfunctional here, very corrupt place (base mafia games run rammpet here) which explains the dysfunctional atmosphere. Good example is the campground host isn't present at night, he's actually working down the hill as a charge of quarters in the bachelor enlisted quarters and not around if you have problems/issues-there are people in his RV but they aren't the hosts??? Funnier is he actually physically lives in his conversion van, you'll see a yellow extension cord plugged into his van to power up his fridge when it's around during the day. The people in his van are his moody GF some other young guy named Steve who will drive around the camp host gator service vehicle acting like the campground host-he's friendly and tries to help it not a campground host...not making this up either...campground host is enabled to do this as he's the mwr directors pet-more examples of the corruption/incompatance at this base. During my visit in fall of 2016, older Lady who regularly works the desk weekdays of mwr/campground checkin didn't understand who is eligible to stay there when I called from California initially to make a reservation, she screamed at me in her moody frustrated state which I asked to speak to someone else, or her boss if no one else was available, this enraged her more so I just showed up and checked in when I got there. Needless to say, she decided to carry a grudge and be even more difficult for the duration and forever with me. So moving on, this same lady either knows nothing about the area, facility or chooses to be difficult and not helpful/spiteful (I think the latter) as she was clueless about lap swimming options (this can be done 1130-1330hrs weekdays at academy LeJuenne Hall free of charge) she also overcharged me on a bicycle rental, charging me the daily not weekly rate. She also knew nothing of where to bicycle ride even though she's an Annapolis native (Annapolis-Baltimore trail is awesome ride!) nor did she advise about using brigade sports complex gym for workouts instead of the less than desirable NSAA gym by blue jacket community center where you check in for camping (brigade sports complex is best place to use showers as campground bathhouse is worse shape than showers/bathhouses in Iraq) Blue jacket community center isn't a good place to use computers, watch TV as again, lady at counter isn't friendly and quite rude projecting anger issues like you're stealing by using the blue jacket community center. Exchange food court is much better as well as brigade sports complex. Best is to check in after 5pm so as to avoid the day crowd entirely here, commanders office is across street and you'll avoid them too. When I departed, week and half later on a Friday a charge showed up on my debit card for camping $24 for camping I didn't do, I had bank stop payment when I noticed charge on Sunday, Monday the campground sent an email invoice about the $24 charge so I made a complaint about what a sneaky and unprofessional waste of gov. Time and resources, the mwr director called me which I let go to voicemail and she played the facetious female act like it was an honest mistake, again more insulting lies. if you're navy/marine corp go to the midshipman store at academy, any and everything navy you could ever dream of as far as navy/marine corp logo stuff. Base has a new exchange/commissary which are very nice, lots of nicer gentlemans wear only second to Oceanis in Virginia Beach IMO. There is a commuter bus (Dillion's bus service #220) to natl mall area wash d.c. Weekdays for $5 per person each way 4:30am every half hour till 7:30am to and loads in D.C. 3:30pm till 6:30pm every half hour returning to Annapolis. loads by navy bagels by academy. This is a nice option for natl mall sightseeing visits as well as this camping option is nice for attending Annapolis boat shows in spring and fall or attending navy midshipman sports games/activities. Seemingly there is a pervasive attitude problem base wide, base mafia crowd finds humor in being difficult and giving bad information as well as sabotaging people? Atypical childishness you find in uneducated/impoverished people who entertain bad attitudes & don't know better than to leave economically/socially challenged places to live a better life. Seemingly I believe they're trying to end tent camping as navybed people aren't able to book tent camping, they say all they can book is RV spots? This is an older camp that has aged and needs new facilities. While they clean the bath house regularly, it always appears dirty because of its age. They had some electrical issues at the sites but the maintenance crew responded pretty quickly to get it fixed. This park has the advantage of being a great location to visit Annapolis or go to the Maryland Renaissance Festival. In addition, you can easily walk to the Exchange and Commissary. Riding a bike into Annapolis is feasible as long as you are comfortable riding on backroads. 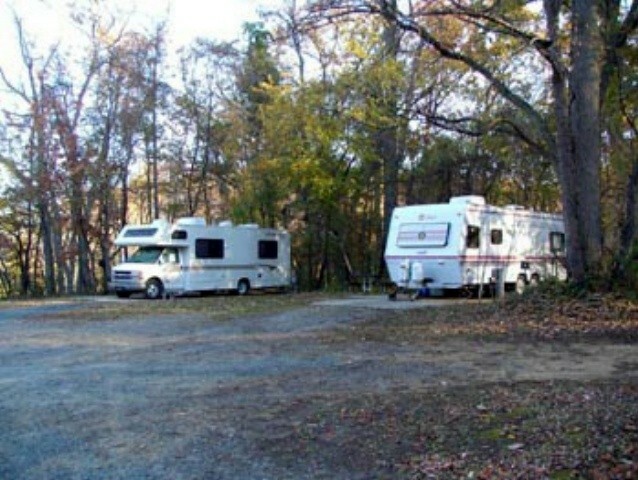 Checking into this campground can be a challenge because there is no decent RV parking at the MWR office and turning around after checking in is hard. Recommend calling the day before to get your site number and visit the office (if possible) after you set-up your site. 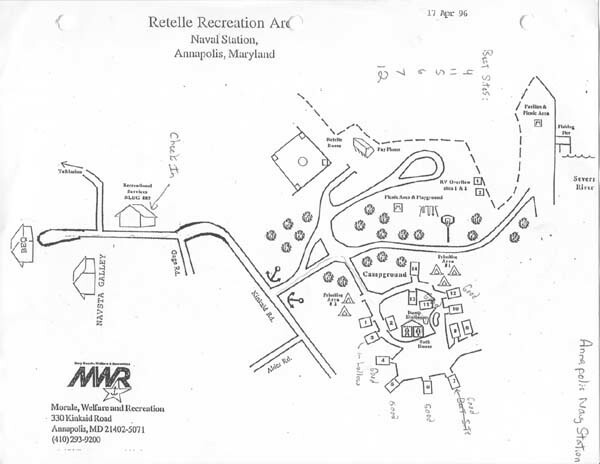 NOTE: According to staff, NSA Annapolis is planning to overhaul this campground soon! 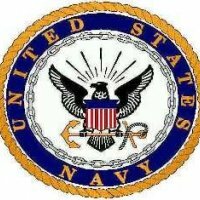 Great location for the USNA and local area. But, camp ground needs lots of work. Lots of work. Recent host lasted less than two weeks. Had falling out with MWR and departed. Instructions for payment leaves much to be desired! Board states go to gym. Woman at gym would not take payment. Informed to call Gateway Inns. Nope! Gateway Inns (the number provided by lady in gym) told us "we don't have anything to do with payment for famcamps/RV/campground." Go figure. Went back to woman in the gym. She then decides to tell us they are having problems with Gateway Inns to collect fees. Few of the numbers were missing from the spaces. Bath rooms were DIRTY. The entire FamCamp needs to be cleaned up. Was told by a home steader camper that camp ground will get a make over soon. i.e. dump station, hook ups, etc. Hope it does happen. Place needs it. Woman who was working in the gym was nice. Respectful and professional. She has her hand tied as far as the payment system goes. Hope she gets higher ups to correct it. Gym does not take any payments. Gateway Inns on other side did a 'we don't know" attitude on us...as well as their customer service rep on the toll free line. Place is good location and should be turning a buck. But nope. Like other MWR ran operations, they don't know how to properly run a FamCamp. NOTE: Galley is closing down end of Sept 2014. So no more galley. That was nice. Long gone now. New NEX and commissary complex is nice. Across the street from old complex. We headed south from Maine to FL for a friends wedding. Our first stop was in Annapolis. I lived across the street years ago so I knew where to find the campground. Even then it was still a bit difficult to find. The sign pointing into the camp was overgrown and barely seen from the road, plus it points you down a gravel road that barely looks like a road at all. We would stay again however there was some confusion with getting a reservation. MWR does NOT run this campground and we had to call some Navy lodge reservation line where the folks at that end seemed confused as to why we were calling them...... Call early with a pen in hand so you can chase down numbers until you find the right person to help you. 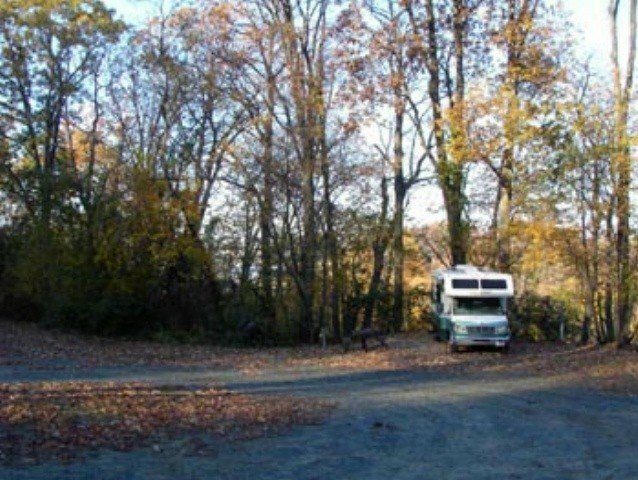 Yes the sites are overgrown with vegetation, the gravel roads are in poor condition, the bath house is extremely old (but clean), the site pads seemed to be a bit narrow (and we were camping in a teardrop), the price is right on to save you some $$$$ while staying in an expensive area. It fit our needs after a very long day of driving to reach our first stop. We would use it again just to crash for one night and move on the next day. A decent site to visit USNA and Annapolis, just don't expect much from the campground. It is a good launching point to visit the area, but nothing for the kids or family to do in the campground. The check-in staff was less than helpful and did not offer to reserve us a site, unlike other reviewers, even when calling to confirm our reservation the morning of our arrival. There is a traffic loop to turn-around near the MWR check-in, but there is no dedicated RV parking for check-in. Our site (#7) had broken glass all over the concrete pad; we called the office to switch but they wouldn't move us; they said they'd send someone out to clean up the glass, but they never did. The pads are concrete and level, but not very wide. The campground is gravel and on a decent incline. Our site was well shaded, especially from noon to sunset, without too much tree overhang. There were no fire rings, but some folks had fire pits burning. The campground is surrounded by the Midshipmen obstacle trail in which the Plebes were running in the mornings - great motivation! If you are in sites 1-4, you may have a group (20+) muddy Midshipmen in front of your campsite, resting after their run, so be aware. The bathhouse was clean, but in need of some updating and repair. The several layers of paint were peeling and rusting, and the bugs were enjoying the place as well. It was in a good state of police, but it wasn't the most comfortable bathhouse. The dump station didn't have a tight fitting for your sewer hose, so you get to enjoy the smells of your visit when flushing. Overall, a decent location and price, as long as you know what you are getting for such a low price. There is no sewage connection, so going in, I knew there was the wife issue. In 3 days, though we used 1/3 of the storage tanks. I called the day we were going to arrive and Navy Getaway had sent a list, so I was able to get a site assigned. #10 had no sign on it, but we did our best and guessed right. Our spot was nice, relatively private. There is no nearby playground, and the roads are gravel, but we didn't have grandkids with us. The bath house needs a little renovation, but is OK and clean. We went down to the Annapolis waterfront for the parade, Naval Academy Band and Fireworks. MWR offered a pool party and food, with watch the fire works from the Naval Support side, but we went to the madhouse anyway. The Baltimore and Annapolis Rails to Trails is nearby, a nice but boring ride, same scenery all along it. Overall, it was a nice place (don't ask my wife), she hates bath houses and camping. We made reservations three months in advance. I would recommend the same because the grounds were full most of the time we were there. Did not look like anyone was homesteading. The bathouse is old and could use a coat of paint, but they do clean them daily. The directions to the campgrounds and rec center are spot on except the gate guard is now manned. As stated earlier, it is NOT recommended you drive your rig down to the rec center. Park on the blacktop parking lot next to the baseball field and call the rec center, and ask if they'll assign you a site. We had site#4. It was sufficient. The staff at the rec center was unfriendly and not helpful. AT&T service was adequate. We used a Dish Network Tailgator, and it worked fine; however, another camper with the same dish had no luck. Digital antenna picked up plenty of channels. A new NEX & commissary is expected to open late Aug 2014. There is a thrift store within walking distance. I broke a golf club and bought another for $3! Beautiful golf course is nearby along with a huge fitness center and ice-rink; however, the ice-rink is closed during the summer. As stated earlier, the NEX gas station does NOT have diesel. I found the WAWA gas station to be the closest (about 5 miles) to sell diesel. To eat: There's the Blue Jacket Cafe just past the rec center on the left. Foods not that great, and they ONLY do breakfast & lunch. There's a Subway between the old NEX & commissary. Not sure if the Subway will stay or not when the new NEX & commissary open. The woods adjacent to the campgrounds contains an obstacle course. Good workout! No WIFI at the campground, but available at the rec center. We had no 30AMP power issues. USNA is about a 15-20 minute bike ride away. Access to the USNA is easiest at the first gate you come to. Can't remember the gate number, but it's NOT the one by the visitor's center. Visitor center gate is VERY busy. Having a Truck Camper this campground is perfect for my needs. Close to everything I needed and the facility is clean close to everyplace I needed. The campground is not in the Academy section of the Navy base. That makes it hard to find and difficult to get to. One has to drive through a residential area on a curvy road where there is a lack of signs pointing to the campground. That is one issue that makes it not big rig friendly. Another reason is that the interior campground road is gravel and hilly with some sharp turns. Most of the sites are concrete pads, but they are not long enough to provide plenty of space for a longer RV. I noticed just one pull through. Power is only 30 amp. There is no sewer. I did not use the dump station. 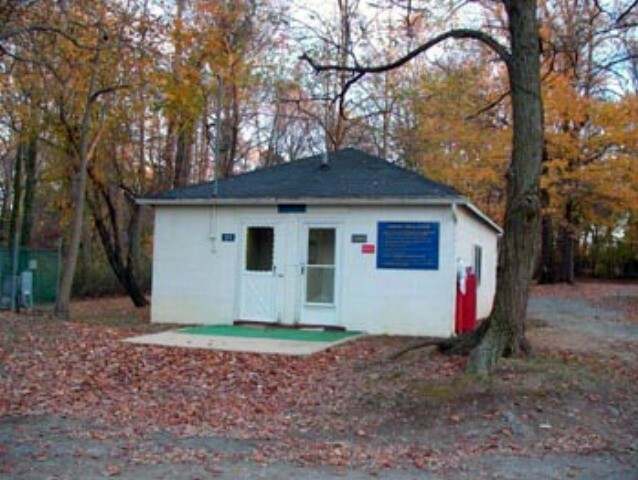 The bath house is an older, heated, cinderblock building. It was clean, but adequate only to serve its purpose. The Wi-Fi signal is not generated from within the campground and is weak. I suspect reception is based on your site location. There is nothing for the kids to do. A primitive area exists for tent use, but sites aren’t marked. Verizon 3G was fine. During another season, I suspect there would be little satellite signal reception. There are a lot of trees. Over the air TV channels are plentiful. The campground is half full of permanents; most likely service members who are stationed there. It is a short drive to the full service commissary, Exchange, gas station (no diesel), and golf course. Check in is at the MWR/gym facility that is past the campground. There are no convenient places to park an RV while you register. They honor the America the Beautiful card for a 50% discount and that is reflected in my rate. This is just an OK campground that is better suited for shorter rigs and those who want an inexpensive place to stage from while being a tourist. It won’t be on my return list. R.L. left this review using the Directory software: - This is beyond a doubt the worst experience ever! Phone reservation went slowly. I was told we'd have to take site 5 for 2 nights and then move to site 12 for 2 nights. Not great, but acceptable. It took about an hour to actually get checked in. The people seemed to care and were friendly enough but either their system is broken or there is no training. She found the first 2 nights easily but was totally lost on the last 2. After checking with everyone in the office and calling someone to go out and physically check the campground (none of which was helpful at all) it was finally decided that the book and the computer didn't agree with each other. Then another long wait to process the credit card charges to cover both sites. I asked why we had to move and was told "some rigs are too large for some of the sites" Actually most of the sites are similar in size and hold our 35' fifth wheel with no problem. There are at least 4 empty sites so it will be interesting to see what the rest of the visit holds. This place is badly in need of someone to take charge and straighten things out. The sites are adequate but nothing special, kind of brushy. Unless you really want to be close to Annapolis I'd try one of the many other camps in the area instead. The instructions were right on the money for checking in, easy to find and the Personal were great to work with. I did have electrical power problems one day and they had an electrician out within two hours of my reporting the problem and fixed with in a half hour after that. This is not a "Resort" but a "Campground" in a very quiet woody area and we loved it. Other campers were never a problem and in fact very outgoing and helpful as was the Base Staff when I had mechanical problems with my Tow Dolly. Wonderful place to stay and I would recommend to anyone and the price can not be beat. The MWR here at Annapolis is a great place to stay! We loved the atmosphere here and the outdoors in the middle of metropolis. We used it to stage jaunts to DC & other attractions around the area. The NEX & Commissary were close by & they were stocked really good with the things we needed. The post gas station was also close by and it said that it had bio-deisel and flex-fuel. We could not have asked for a better park to stay in. Nothing has changed since our first visit here in 2005. But we return every year. Rates have not changed either, still $18/$9 Golden Age Pass. Cleanliness has diminished since our last visit. It's still a good value though.